Wentworth Boughn, Author of Waiting for the Greys! Today we are interviewing Wentworth Boughn, author of Waiting for the Greys! I always wanted to be a running back for the Kansas City Chiefs and be a writer. The football career hasn’t panned out yet, so I am focusing on the writing. Clarence Matussey and Almost Doug are on a quest to expose the truth regarding alien greys. They find a metallic rod that has extraterrestrial powers. With a swish of the wand, small miracles occur. 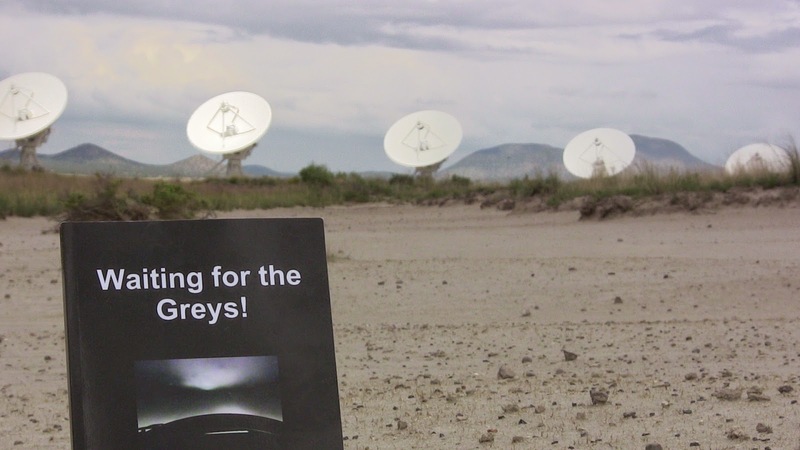 When a message is received that the Greys are returning, the true believers gather out in the desert and wait for their salvation. What inspired you to write about alien Greys? It is a novel that I would want to read. I like stories about underdogs on mad missions. Flying saucers are fun. I think Waiting for the Greys! would be good for people who have lottery tickets in their pockets and none of the numbers are winners. Tell us a bit about your main character, Clarence Matussey. Even while hanging spread-eagled upside down, it was apparent that Clarence was an earnest dresser… He was a gum chewer, but not a bubble blower… Becoming a UFO investigator didn’t require a degree or any certification. The only requirements seemed to be an unyielding belief in conspiracy and the will to withstand endless ridicule. Luckily, Clarence had both… He felt a certain purity and superiority that no one was willing to pay him for his work. I have never read an ebook except for the one I wrote, and I really liked it. Every word is true except for the made up parts. Clarence and Almost Doug saw what all the believers and curious tourists see who make the long, lonely ride through the desert on the Extraterrestrial Highway to Area 51: the black mailbox (now white and covered with graffiti) which was a good spot to observe the test flights of flying saucers, the white bus with the blacked out windows that carried employees to and from the secret facility, the security cameras and monitoring devices hidden amidst the cacti and rock, and the notorious cammo dudes in their SUV’s parked up on a hill, always watching. Almost Doug had heard the stories of trespassing truth seekers being taken away by the cammo dudes, never to be seen again. He took some quick photos of Clarence in front of the signs that stated photography is prohibited and deadly force may be used on trespassers. They would make good photos for THE TOTAL TRUTH! website. Almost Doug felt they had gotten what they needed and wanted to leave quickly. The cammo dudes were watching them through binoculars from up on the hill only a couple hundred yards away. He shuddered when Clarence turned deliberately toward the cammo dudes. “Please, not the finger,” whimpered Almost Doug as Clarence raised his fist. Clarence didn’t use the middle finger. He wasn’t crass. Instead, Clarence pointed at the cammo dudes with such self-righteous indignation, that it was more condemning than flipping them the bird. One would like to think that maybe the cammo dudes peed a bit in their cammo pants. Clarence’s strident finger served them notice. It was a warning to the entire military industrial complex that Clarence Matussey was going to find the total truth.